Waddling off the Oosterdam after a 7-day eat-a-thon, we were pretty much sick of food. Yet, as it was closing in on lunch, we needed to still eat something. Seeing how we ate almost every conceivable mainstream cuisine (well, at least they attempted to make certain cuisines), there was not much to choose from, except for Dim Sum. 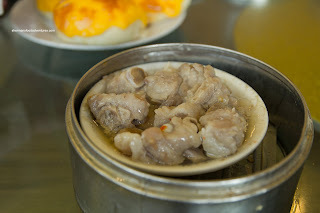 Yes, there was no Dim Sum on the cruise. That was probably a good thing... Okay, therefore we were in search of Dim Sum. One problem though. We weren't in Vancouver. The cruise let off in Seattle. 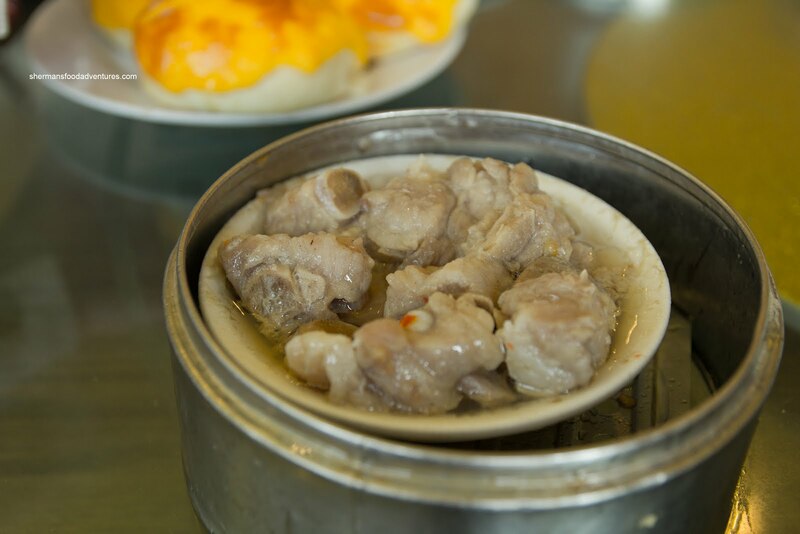 Much like our pre-cruise Dim Sum experience, it would have to be in Bellevue because we had left our car at Goose's house. We had visited Joi's a week prior and it was not bad (as with Top Gun a few months before). 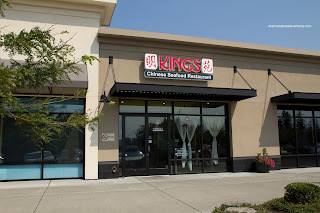 Hence, we had high hopes for King's Chinese which boasted similar ratings on Urbanspoon. We arrived to find that they still employed push carts (much like the other places in town). 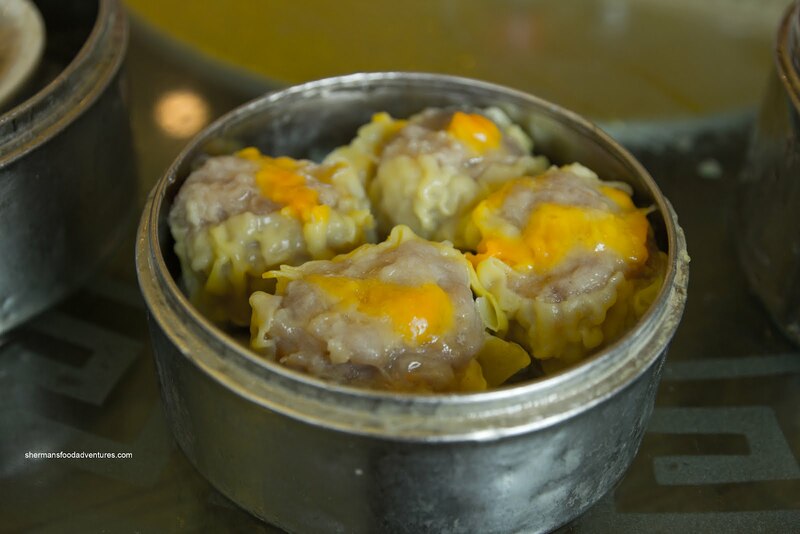 We got a bunch of things to start including the standard - the Haw Gow (shrimp dumpling). Not sure if they knew we just got off an Alaskan cruise, but they did their best to remind us of the cold since that was the serving temperature. 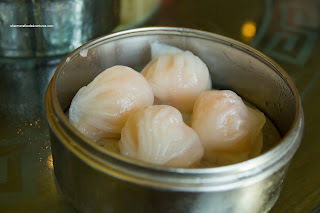 Therefore, the dumpling skin was hard and doughy. The filling wasn't half-bad with cold-water crunchy pieces of shrimp. It was packed loosely though and rather bland. On the other hand, the Sui Mai (pork & shrimp dumpling) were much better, in terms of being served hot and in execution. They were big and had a slight bounce texture, although there were some soft spots. The predominant flavour was pork (duh, it is made of pork) which could've been masked by more seasoning and/or more shiitake mushrooms and shrimp. Onto the Beef Meatballs, they were processed and tenderized properly where there was a bounce texture. However, there was quite a bit of green onion which dominated the flavour profile. Beyond that the rest of the seasoning was balanced. Although it was mostly tender, there were the occasional chewy pieces though. 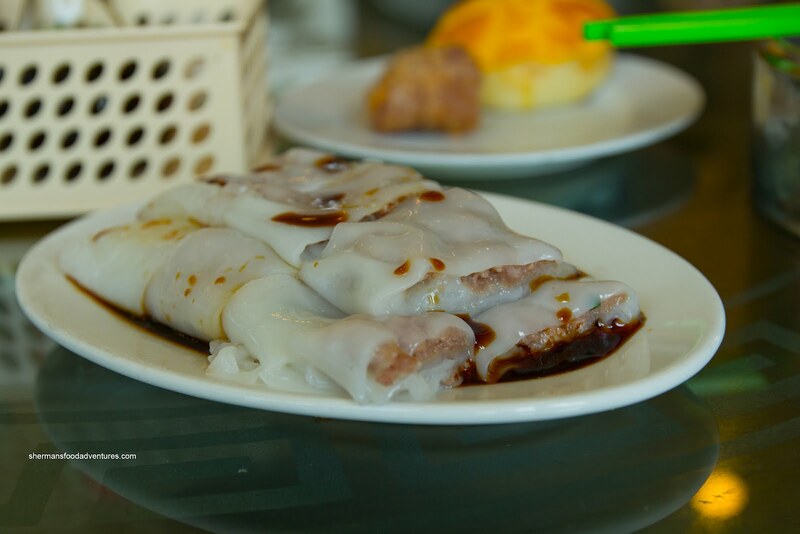 With many restaurants, the beef filling in the Rice Noodle Rolls are often closely linked to the ingredients of the Beef Meatballs. Yet in this case, the beef in the rice noodle roll had gone bad. We noticed a tinge of sour aftertaste. Unless they were putting vinegar into the beef mix, this indicated that the beef had deteriorated. We didn't get enough of a sample to comment on the rest of the dish. We sent it back and to their credit, they took it off the bill and apologized. We ended up having the Shrimp Rice Noodle Roll which we were able to eat (since it wasn't filled with the bad beef). The rice noodle was quite thick and chewy while the shrimp filling was salty. The small pieces of shrimp did have a snap though. 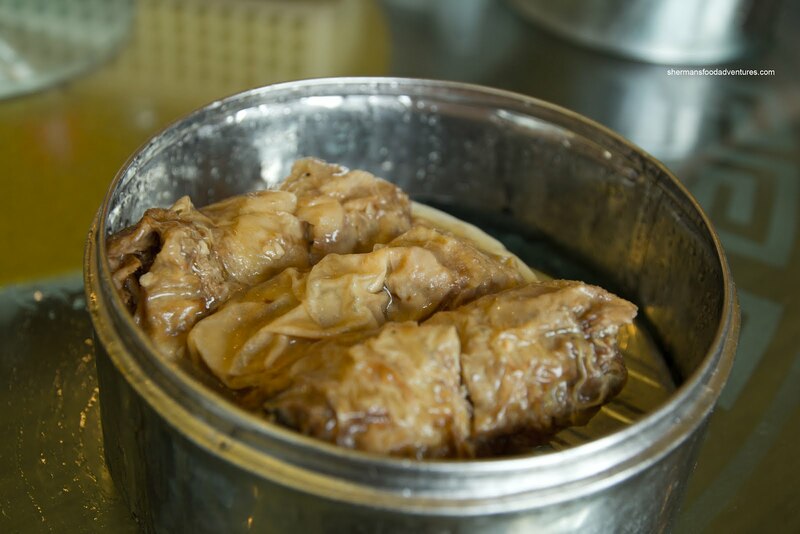 One of my favourite Dim Sum dishes is the Seen Jook Guen or Bean Curd Skin Roll (usually filled with pork). Unfortunately, this one was pretty average at best. The rolls were really loose due to the lack of filling and an overall poor wrap job. Furthermore, the filling was inundated with so much bamboo shoots (which were not rinsed enough), it was the only flavour I could taste. 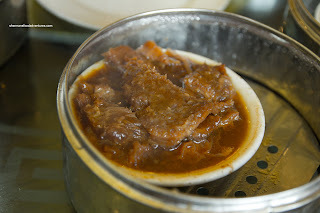 Next up was a very modest portion of the Steamed Spareribs. The meat was more chewy than tender, yet it wasn't inedible either. There were only a few "good" pieces (which were the the ones with meat attached to the bone) with the rest being cartilage and fat. In terms of flavour, it was one-note which was primarily salt. 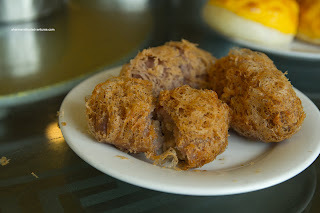 After that unsatisfying offering, we continued down the road of mediocre Dim Sum with the Honeycomb Tripe. It arrived in a dark shade of brown and completely overcooked. It was so soft, I barely needed to chew it. Yes, I'd much prefer soft than chewy, but this was almost a melting texture. Along with a bit of spice, the taste of the dish was mostly sweet. It was like eating a dark-coloured candied tripe. Onto a fried item, we had the Wu Gok or Fried Taro Dumplings. These were pretty much on par with most of the other items we had so far - not very good. They were oil-logged (indication that the oil was not hot enough or they fried it too long or both). Hence, the mash taro exterior was greasy and unappealing. 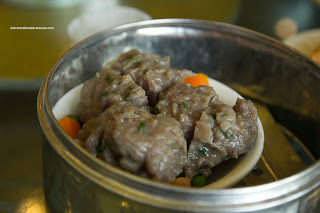 On the other hand, the predominantly ground pork filling was not bad. It was moist and well-seasoned. Continuing on the fried theme, we had the Stuffed Eggplant. Finally, we had a dish that didn't garner many complaints. 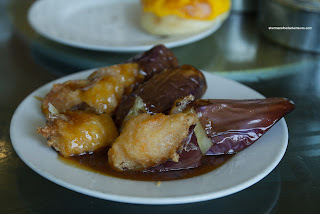 The exterior was crispy while the eggplant was moist while not overcooked. The shrimp mousse filling had a nice bounce texture while not being overseasoned. The black bean sauce was a touch weak, yet it didn't make or break the dish. We had a few more dishes which didn't leave much of an impression and to tell you the truth, I'd only be repeating what I've been saying in this whole post - the food was mediocre. Naturally, being in Bellevue, we need to have reasonable expectations. There is no way we can compare it to Vancouver, B.C. Yet, King's does not stack up to the local competition such as Top Gun and Joi's. Hence, I would go to the those places rather than King's. It could be that it was an off day, but it really wasn't that great IMO.